ELECTRIC REEL DRIVE SYSTEM ELIMINATES ALL POTENTIAL LEAK POINTS IN THE REEL CIRCUIT: Electric motors drive cutting units Electric motors drive cutting units. Ninety percent of all hydraulic leaks occur in the reel hydraulic circuit, mainly due to the necessity of having flexible hoses extending from the front of the machine for the front reels. These hoses see a lot of flexing during the mowing day as cutting units are raised and lowered. Cutting units also steer and float to follow undulations, increasing fatigue for the reel motor hoses. The 7500A and 8000A E-Cut™ Hybrid Fairway Mowers have eliminated all reel circuit leak points by removing all hydraulics from the cutting unit drive circuit. This has eliminated the following hydraulic components - Reel drive section of hydraulic triple pump, hydraulic reel motors, backlapping valve, flexible hoses, fittings, hard lines. Fewer hydraulic components leads to fewer leaks, increasing confidence that the finely manicured turf will not be damaged by hot hydraulic oil spilled onto a playing surface before an important tournament. EASILY ACCESSIBLE DAILY SERVICE POINTS MEAN LESS MAINTENANCE TIME AND MORE TIME WORKING: Easy access for cleaning Easy access for cleaning. Easier daily maintenance points are designed into the machine to assist operators with complete daily maintenance and to keep the machine running at peak performance, saving valuable time and money. For ease of service, all daily engine checks are easily accessible by raising the hood. These service points include an engine-oil level check, a coolant level check, hydraulic fluid level, and an air-restriction indicator. The A-model PrecisionCut™, E-Cut™ Hybrid, and TerrainCut™ mowers feature a radiator screen easily removed without tools and tilt-out oil cooler for easy cleaning. EHYDRO™ HYDROSTATIC PUMP AND LARGE-CAPACITY WHEEL MOTORS FOR SERIOUS HILL-CLIMBING CAPABILITIES: The eHydro™ traction pump and wheel motors in the new A-model takes performance, traction, and operation to the next level. We designed the new system to take on the most challenging course conditions. These improvements to the traction system makes the A-models ideal for undulating terrain providing superior performance and traction out on the course. The traction system in the A-models is driven by a servo-controlled hydrostatic pump. The control of the pump is no longer mechanical linkages but instead it is electronic. In total approximately 94 parts have been eliminated from the traction drive system along with 4 adjustments compared to prior models. The design reduced the complexity of the drive system meaning no more linkages to adjust or repair decreased routine maintenance and providing reliable day-in/day-out operation. Forward/reverse pedals The operator will like the eHydro, too. The pedal effort has been reduced, thus reducing the foot fatigue during many hours of mowing. AUTOPEDAL™ FEATURE LOWERS SOUND LEVELS AND FUEL CONSUMPTION DURING TRANSPORT: The AutoPedal feature controls engine rpm and transport speed of the machine through the eHydro™ foot pedal controls. AutoPedal is similar to an automobile gas pedal operation; the more the forward pedal is pressed, the faster the machine moves and the higher the engine rpm; pressing the pedal less, the slower the machine moves and the lower the engine rpm. On conventional machines, the engine rpm is controlled by the operator by means of a manual or electric/manual throttle. Operators are trained to always operate the engine at wide open throttle. Running at wide open throttle means running the engine at its fastest speed, which increases the sound levels and fuel usage. The AutoPedal system allows the engine to only run as fast as needed, meaning that as operators transport around the course, the engine speed is only as fast as needed for the transport speed. If the operator approaches play and stops, the engine rpm goes to idle. This makes transporting quieter and since the engine does not run full speed all the time, it reduces fuel consumption. Once the operator reaches the mowing site, engages the mow switch on the CommandARM™ controls, the engine rpm automatically increases to full throttle for mowing. LARGER, 63.5-MM (2.5-IN.) FRONT GROOVED DISC ROLLER COMPATIBLE WITH FAIRWAY TENDER CONDITIONER (FTC) AND GREENS TENDER CONDITIONER (GTC) ATTACHMENT FOR 22 IN. (55.9 CM) QUICK ADJUST 5 REEL CUTTING UNITS: Grooved disc roller The grooved disc roller can be used with 55.9 cm (22 in.) 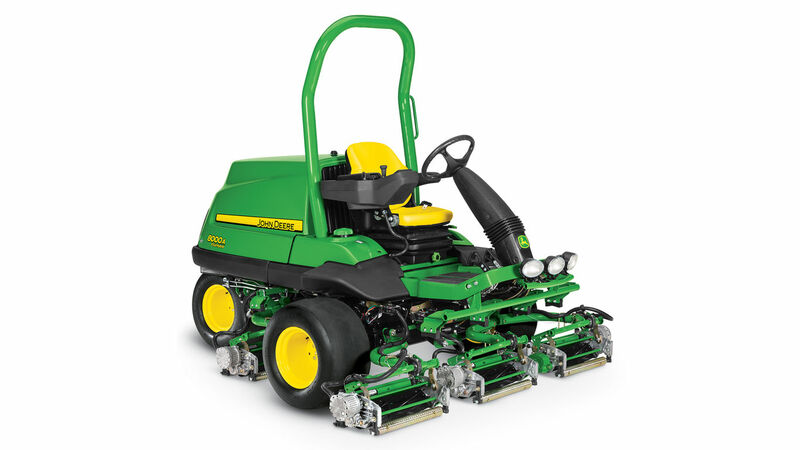 Quick-Adjust 5 (QA5) cutting units, in combination with the GTC and FTC, to provide additional roller options for fairway, tees, and approach areas. The increased diameter improves the durability over smaller rollers and it features hardened discs for improved wear which retains spring tension for reduced maintenance, making it an ideal roller for fairway, tee, and approach mowing.